The Wednesday Weekly is back from a quiet and hot summer to share news, announcements and information from the KFG. If you have something you would like to share with us and your colleagues via the Weekly please contact johannes.duschka@uni-leipzig.de. 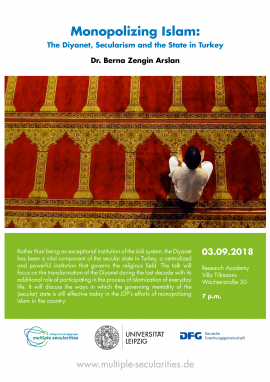 The KFG invites to a public lecture on Monopolizing Islam: The Diyanet, Secularism and the State in Turkey by Berna Zengin Arslan (Özyeğin University Istanbul). It will be held on 3 September 2018, 7 p.m. at the Research Academy Leipzig, Villa Tillmanns, Wächterstraße 30. Rather than being an exceptional institution of the laik system, the Diyanet has been a vital component of the secular state in Turkey, a centralized and powerful institution that governs the religious field. The talk will focus on the transformation of the Diyanet during the last decade with its additional role of participating in the process of Islamization of everyday life. It will discuss the ways in which the governing mentality of the (secular) state is still effective today in the JDP’s efforts of monopolizing Islam in the country.